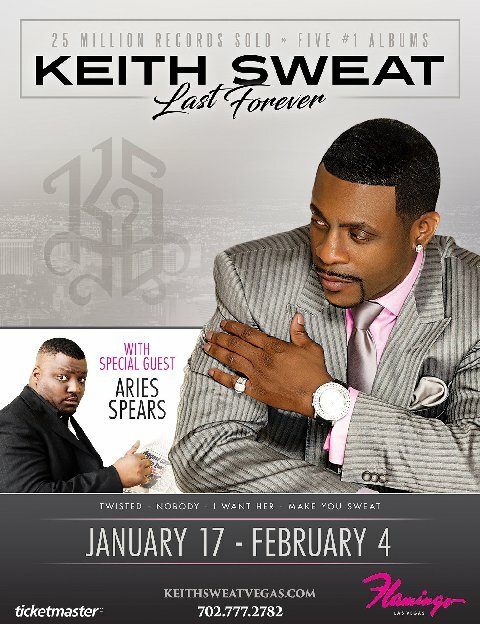 Keith Sweat: "Last Forever" - LIVE in Las Vegas | Jan. 17th – Feb. 4th, 2017 - TheUrbanMusicScene.com | Concerts & Festivals! Born in Harlem, New York, Keith Sweat originally worked for the commodities market at the New York Stock Exchange before he was discovered singing at a nightclub in 1987. In November of the same year, he released his first album, “Make It Last Forever,” which sold more than three million copies. Since then, Sweat’s music career has spanned nearly 30 years and includes numerous hit singles. The legendary R&B icon has released 11 albums, delivered five straight #1 albums and has sold more than 25 million records while also taking on the role of music producer, songwriter and radio host.